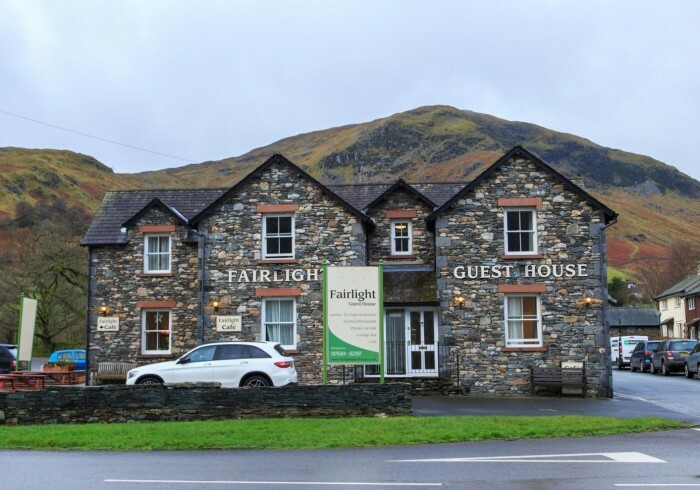 FAIRLIGHT GUESTHOUSE AND CAFE HAS 7 EN SUITE BEDROOMS , LOCATED AT THE CENTRE OF GLENRIDDING VILLAGE, IN ULLSWATER LAKE DISTRICT UNITED KINGDOM . WE HAVE OUR OWN CAR PARK FOR OUR GUESTS. WE HAVE EASY ACCESS OR FEW MINUTES WALK TO ULLSWATER SAILING CLUB, ULLSWATER STREAMERS AND TWO MNIUTES WALK TO INN ON THE LAKE, THE MOST FAMOUS HOTEL FOR WEDDING VENUE. THERE IS A NEAREST BUS STOP, FEW MINUTES WALK FROM THE GUESTHOUSE. OUR CAFE, RESTAURANT IS OPEN FROM 8:00 AM TO 5:00 PM ,SIX DAYS A WEEK. WE OFFERS HOT AND COLD SANDWICHES , SELECTIONS OF BREAKFAST, SOUP AND LUNCHES.